On Feb. 10, Hay’at Tahrir al-Sham (HTS) and Hurras al-Din (HAD) reached a new accord. The agreement was forged after nearly two weeks of vitriolic debate — the latest in a series of disagreements between HTS and a group of al Qaeda veterans. The latter camp is trying to undermine the authority of HTS leader Abu Muhammad al-Julani and his lieutenants, but there are also deeper issues regarding the direction of the jihad in Syria. In late January, HAD’s leadership accused HTS and its leaders of proposing to establish a military council that would come under the authority of an Assad regime defector. The HAD leaders — Abu Hammam al-Shami and Dr. Sami al-Uraydi, both of whom are al Qaeda veterans — insinuated that this council would be under the control of Turkey, or Turkish-backed rebel groups. HTS denied that this plan had really been put forth. The al Qaeda veterans also alleged that HTS was willing to reopen a highway linking northwestern Syria to regime-controlled territory and that HTS was withholding certain weapons that are rightfully theirs. These accusations set off a storm of controversy in jihadist circles, with dozens of parties both inside and out of Syria getting involved. On Feb. 5, in the middle of this tense situation, Ayman al-Zawahiri issued a stinging rebuke of the jihadist project in Syria, accusing his coreligionists of competing for “imagined authority” over territory that is under the dominion “of secular Turkish checkpoints.” Although HTS and Julani weren’t mentioned by name, Zawahiri’s words were clearly aimed in their direction, and probably others as well. Still, Zawahiri did not directly rebuke Julani, nor did he disown HTS. HTS members say HAD fighters fired on this car, which was carrying HTS’s men, one of whom succumbed to his wounds. The situation became even more precarious when HAD members shot at a car carrying HTS members through a checkpoint in southern Aleppo on Feb. 7. There was a risk that the hostilities could escalate further, but both sides quickly decided to stand down, signing a hasty agreement to resolve the matter. HAD also published a eulogy for the HTS fighter who died from his bullet wounds. 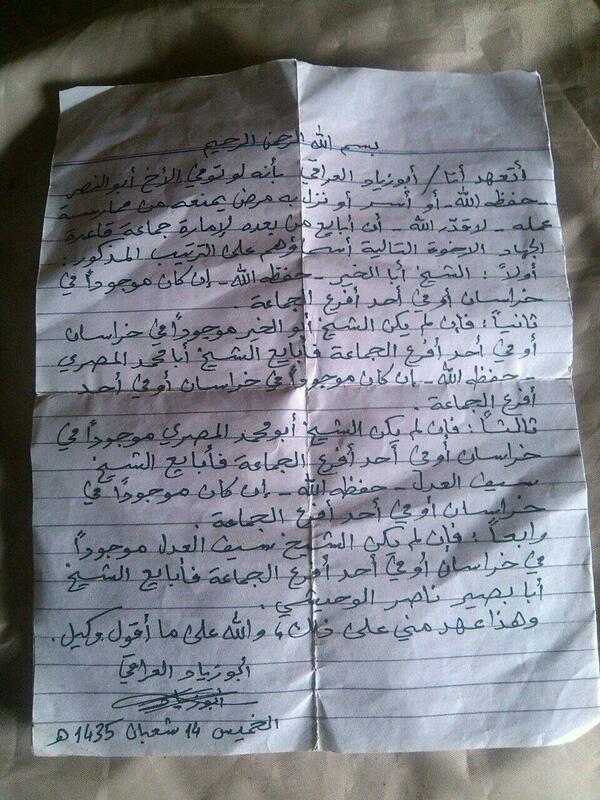 On Feb. 8, the jihadists circulated a handwritten agreement in which both organizations swore to end their war of words and cooperate against their common enemy. 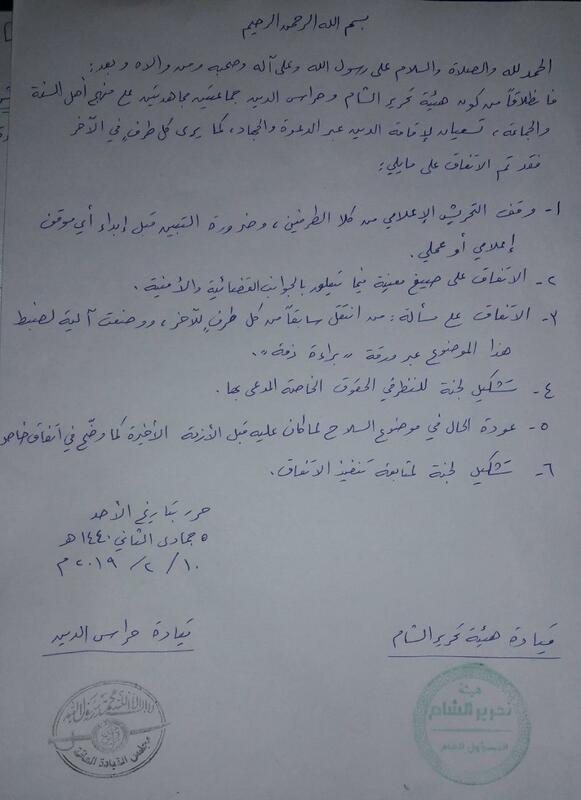 HTS and HAD agreed that an Islamic court would handle the checkpoint shooting. HAD also said it would coordinate with HTS any time its men wanted to conduct operations in certain areas controlled by HTS. Then, on Feb. 10, HTS and HAD entered into a broader agreement that has six main points. The two sides promised to stop criticizing each other in the media and establish committees to adjudicate certain “legal and security” matters, as well as to monitor compliance with the agreement. In their critique of HTS’s leadership, Abu Hammam al-Shami and al-Uraydi made a big deal over certain unspecified weapons that they claimed HTS had wrongly kept from them. The two sides have now agreed to abide by a previous accord, which appears to have favored HTS. The jihadists have not explained how the latest agreement was reached. But over the past sixteen months, if not longer, a senior al Qaeda figure has repeatedly attempted to settle the two sides’ differences. That figure is Abu ‘Abd al-Karim al-Masri (“Karim”). Jihadists have identified Karim as a member of the shura council for al Qaeda’s general command, making him a very senior personality within the organization. FDD’s Long War Journal has used several statements to trace Karim’s presence in Syria. In late 2017, HTS named him as the head of a committee that was established to reconcile HTS and its critics. That effort came in response to an initiative that was promoted by al Qaeda’s global network, which sought to end the infighting in Syria. Julani and Abu Hammam met under Karim’s supervision and brokered a deal in early 2018, though it appears that Abu Hammam’s comrades-in-jihad rejected it. There is some ambiguity regarding what exactly transpired. By late 2018, Karim had established the “Holding Fast Committee,” which was still working to mediate any problems between HTS and HAD. Karim’s three-person committee did in fact resolve one thorny issue involving a young girl whose father had died in Syria. It is sometimes difficult to offer precise identifications for jihadists, especially those known only by their aliases. But Abu ‘Abd al-Karim al-Masri may also be known as Abu ‘Abd al-Karim al-Gharbi. If so, then this identification is especially important. Al-Gharbi has been a prolific commentator on both Twitter and Telegram, though his channels are often suspended. Some of al-Gharbi’s companions have previously disseminated a biography claiming that his jihadist career has spanned the globe, including multiple stops in the West, and that he worked for Osama bin Laden. Again, FDD’s Long War Journal cannot say for certain that they are one and the same man — but it appears to be the case. What follows is a history of the disagreements between HTS, HAD and others, with keen attention paid to the roles played by Karim and al Qaeda personalities. The first major quarrel between HTS and its jihadist critics erupted in 2017. Jihadis began hurling a number of accusations at HTS and its leader, Abu Muhammad al-Julani. Al-Uraydi eventually accused Julani of breaking his oath of allegiance (bayat) to Zawahiri. Al-Uraydi and others added that HTS had diluted the jihadist ideology. In Oct. 2017, Al Qaeda’s global network launched a reconciliation initiative between HTS and its critics. The initiative was supported by multiple parties inside and out of Syria. HTS eventually responded by naming Abu ‘Abd al-Karim al-Masri, a member of al Qaeda’s shura council, as the arbiter of the dispute. The disagreements became so heated that al Qaeda’s global network launched a campaign to resolve the issue. In late Oct. 2017, al Qaeda channels began publishing multiple statements in support of an urgent reconciliation initiative. The effort was initially headlined by two high-profile, pro-al Qaeda clerics: Abu Qatada al-Filistini and Abu Muhammad al-Maqdisi, both of whom subsequently dropped out, at least publicly. Regardless, many others lent their voices to the effort. The statements of support came from parties around the globe, including fighting factions and scholars inside Syria. The parties outside of Syria that endorsed the mediation effort included: Al Qaeda in the Islamic Maghreb (AQIM), Iyad Ghali, Jund al-Islam in the Sinai, Abu Zar al-Burmi (an al Qaeda-affiliated ideologue in South Asia), among others. Abu Hammam al-Shami, along with his al Qaeda compatriot Abu al-Qassam, endorsed the initiative as well. At first, HTS apparently did not formally respond. In early Nov. 2017, a supervisory committee for the reconciliation initiative publicly complained that it had not received an “official response” from HTS and, therefore, its efforts had been delayed. The supervisory committee encouraged HTS to respond, so it could get to work. Later that same month, however, HTS arrested Dr. Sami al-Uraydi and his ally, Abu Julaybib al-Urduni. Though their incarceration proved to be short lived, their detention exacerbated tensions even further. On Nov. 28, 2017, Zawahiri weighed in with a message of unity, but also expressed his extreme displeasure with the situation. The al Qaeda emir made it clear that he did not approve of anyone breaking their oath of allegiance to him. This critique was aimed at HTS and its predecessor organization, Al Nusrah Front, which was rebranded as Jabhat Fath al-Sham (JFS) in July 2016. Al Nusrah Front’s emir, Abu Muhammad al-Julani, publicly distanced JFS from al Qaeda at the time — though his wording was deliberately ambiguous. Zawahiri’s Nov. 28 message provoked a reply from Abu Abdullah al-Shami, an HTS official who defended the moves made by his boss, Julani. Al-Shami claimed Al Nusrah didn’t really break from al Qaeda in mid-2016, but instead wanted to convert its allegiance from public to private. (Other sources corroborate this version of events and the thinking behind Al-Nusrah’s rebranding in mid-2016. Zawahiri himself said he disapproved of a private oath.) Al-Shami added, however, that they intended to become independent over time — a move that al Qaeda’s senior leadership rejected. Other barbs were traded and multiple individuals became involved in the matter. Just days after Zawahiri’s critical message, however, HTS finally agreed to a mediation effort. On Dec. 2, 2017, HTS announced in a short statement that it had established a committee to communicate with the “honorable clerics” who launched the “And Such Settlement is Best” reconciliation initiative discussed above. Karim was named as the president of HTS’s new five-person committee. HTS said it was “complying with this initiative” outside of the media’s spotlight. The group claimed that it had made an attempt to come up with a “practical solution” to the “problem” concerning “brother Qassam and those with him.” It is likely that “brother Qassam” is Khalid al-Aruri, an al Qaeda veteran who was close to Abu Musab al-Zarqawi, the founder of al Qaeda in Iraq. Aruri was reportedly released from some sort of custody in Iran in 2015. He made his way to Syria, where he has been involved in the debates over HTS and the direction of the jihad. According to HTS, Karim’s committee would communicate with one of the clerics in the reconciliation initiative, but this ideologue’s name was withheld “for security reasons.” This was a suspicious statement, as many of the personalities involved in the debate had been named in online sources. But Karim’s committee wanted to keep the identity of this cleric secret. Karim’s committee would work toward the release of HTS’s “detainees,” and vowed to cease the “escalation” on “both sides” until a sharia-compliant solution that served the best interests of the Syrian jihad was reached. 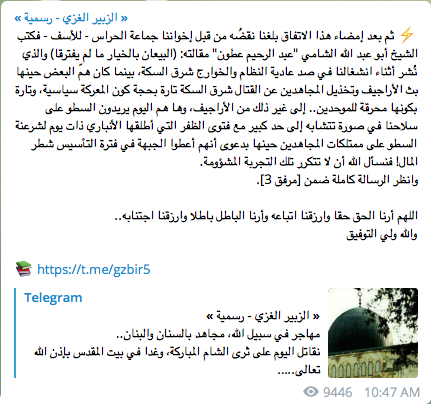 In the meantime, HTS ordered its members to stop discussing the issue both in private “among the mujahideen’s ranks” and in the “media” (meaning online). In addition, all of the “brothers” were encouraged to stay on the front lines and unite. HTS named the other four members of its committee as: Sheikh Abu Malik al-Shami, Abu Qatadah al-Albani, Mukthar al-Turki, and Abu Musab al-Shami. 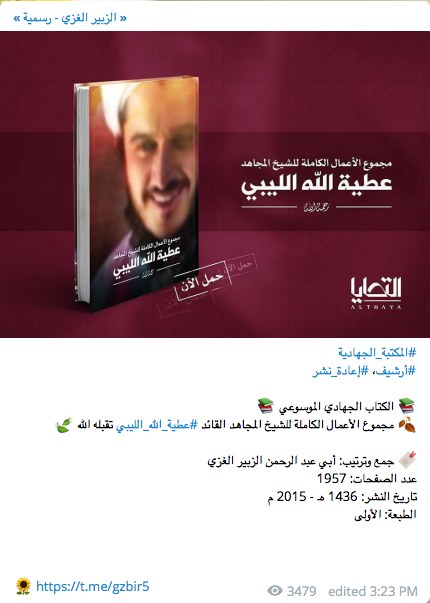 Readers should remember the name Abu Qatadah al-Albani in particular, as he will reappear in this account during events that occurred in early 2019. On the same day (Dec. 2, 2017) that HTS announced its reconciliation committee, Abu Hammam al-Shami, a chief critic of HTS leader Julani, circulated a three–page message online. Abu Hammam stressed that he had sworn allegiance to Osama bin Laden and Ayman al-Zawahiri long before the current Syrian war, with its various al Qaeda iterations. He renewed his fealty to Zawahiri, stressing that he wouldn’t abandon his blood oath under any circumstances. Abu Hammam claimed that he was preparing to have a sit down with Julani, with whom he had disagreed on “operational strategy” for “more than a year,” when HTS arrested its critics. He warned that “Turkish protection” hadn’t saved other areas of Syria and stressed that the Sunni jihadists could not model themselves after Hezbollah, an Iranian-backed terrorist group that has rooted itself within Lebanese society. Hezbollah, Abu Hammam reminded his readers, receives the backing of nations that are part of an international system the jihadists oppose. Abu Hammam explained he had affirmed during meetings with Julani and another HTS official, Abu Malik-Shami (who appears throughout this story), that they were “brothers” regardless of conditions or organizational affiliations. Tellingly, Abu Hammam implored HTS to behave like the Taliban in its relations with al Qaeda. There is a “huge difference,” however, as the Taliban was less reliant upon al Qaeda than HTS had been, he wrote. The Taliban did not consider al Qaeda to be a “competitive project,” nor did it shrink from its relationship with al Qaeda even as the US-led coalition’s bombs fell in Afghanistan. Abu Hammam claimed that the “majority” of al Qaeda’s men in Syria are “ansar,” meaning locals, while in Afghanistan al Qaeda was “mostly composed” of muhajireen, or foreign fighters. His point was that al Qaeda stood out more in the Afghan context, and yet the Taliban didn’t betray its ally. Abu Hammam wrote that Julani was once proudly part of al Qaeda. He asked: “What has changed?” He claimed that a “large percentage of [HTS’s] soldiers are still with you because they assume you are secretly affiliated with al Qaeda.” Julani’s emirs convinced the rank and file that the “secession” or “disengagement” from al Qaeda’s leadership was really just a “media cover” and the “allegiance” was “still effective in secret.” Abu Hammam is not alone in this claim. As noted above, other sources, including an HTS official who serves Julani, have said that Al Nusrah’s disengagement from al Qaeda in 2016 was merely a media ruse. Even Dr. Sami al-Urayi, who became a fierce critic of HTS, stayed with Al Nusrah well after its disassociation from al Qaeda. Still, there is no question that significant problems arose from the move. In the weeks following HTS’s Dec. 2, 2017 announcement, the two sides met under Karim’s supervision. An accord was struck by early January — or so it seemed. On Jan. 7, 2018, a message attributed to Abu Hammam appeared on one of the Telegram channels that has reliably disseminated his statements. Abu Hammam said that while he agreed with Julani on a number of points, some of his colleagues had raised objections, so he decided to refer the matter to scholars involved in the reconciliation initiative. It isn’t precisely clear what happened next, as both sides have blamed each other for failing to live up to the agreement. Abu Hammam and his men formed Hurras al-Din (HAD, or the “Guardians of Religion” organization) in Feb. 2018, and it has been operating throughout HTS-controlled territory since then. HAD hosts training camps named after other al Qaeda veterans and launches regular attacks on Assad regime positions. According to Abu ‘Abd al-Rahman al-Zubayr al-Ghazi, an HTS military judge, HAD was announced while HTS was preoccupied battling its foes. Al-Ghazi has been involved in the disputes between HTS and HAD, including the most recent round. Al-Ghazi has shared insider documents, including al Qaeda statements that haven’t been disseminated to the public, as well as other details. Although al-Ghazi has posted these documents just recently, they have a direct bearing on the events that occurred from mid-2016 through the beginning of 2018. Importantly, al-Ghazi reported that Julani and Abu Hammam reached a 16-point agreement in the presence of Abu ‘Abd al-Karim al-Masri (“Karim”) — the al Qaeda shura council member. That “interest” undoubtedly involves the political project Julani and his comrades have undertaken, as they are attempting to build a new Taliban-style state. According to Al-Ghazi’s account, HAD and HTS agreed that: HAD would not host Islamic State or Jund al-Aqsa cadres that had clashed with HTS, “all organizational disputes” would be handled by the “sheikh who presides over the committee” (presumably Karim), and no one could defect from one group to the other without the approval of his prior organization’s leadership. The tenth and final point summarized by Al-Ghazi seems especially important. HAD agreed that it would not question the “sharia or political positions” of HTS in the “media” — meaning HAD wouldn’t criticize HTS on these types of issues in public. HAD could question such matters in “private” with the “agreed upon sheikh.” That meant that HTS’s political project, including its delicate diplomacy with Turkey and other moves, were supposed to be critiqued behind closed doors. All of the signatories agreed that they would renew their oaths of fealty to al Qaeda in the event that Ayman al-Zawahiri was killed or otherwise incapacitated. All six authors specified that they would pledge allegiance to Abu al-Khayr al-Masri, followed by Abu Muhammad al-Masri, Saif al-Adel, and then Nasir al-Wuhayshi (then the emir of AQAP and a senior manager within al Qaeda’s global organization). The oaths stipulated that each al Qaeda leader be physically located in the Khorasan (Afghanistan or Pakistan), or in one of al Qaeda’s regional branches. The signatories agreed to move down the chain-of-command until one of Zawahiri’s deputies was appropriately situated to accept his oath. 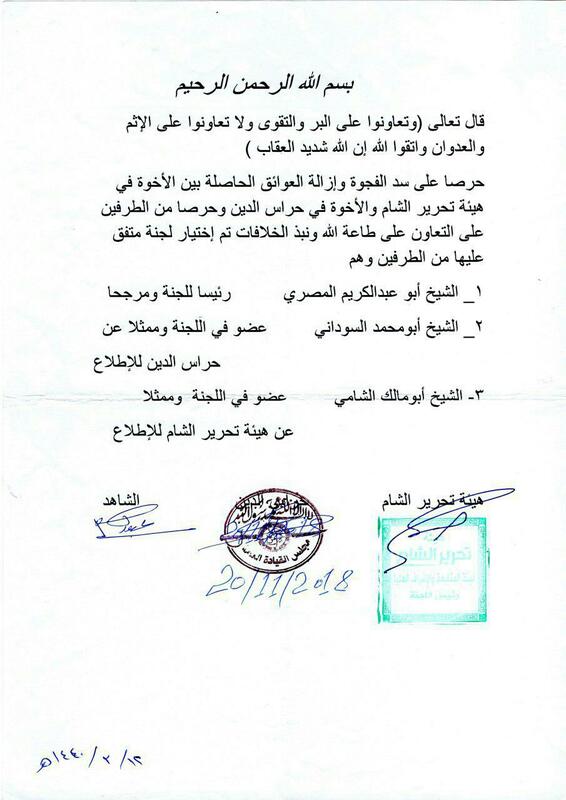 Al-Ghazi introduced these documents to support HTS’s argument that Abu al-Khayr al-Masri, who was located in Syria at the time and served as Zawahiri’s chief deputy, had the authority to authorize Al Nusrah’s 2016 disengagement from al Qaeda. Both Abu Muhammad al-Maqdisi and Abu Musab al-Suri (a former Al Nusrah Front official) have disputed this argument, and al-Ghazi thought it was necessary to respond. There are many facets of this back-and-forth that are not in public view, so it is difficult to assess who has the better of the argument. It seems that Zawahiri and other senior al Qaeda management figures objected after Al Nusrah Front was rebranded as Jabhat Fath al-Sham (JFS) in July 2016. However, their correspondence with Julani and others has not been made public. It is clear, however, that even after the July 2016 rebranding JFS/HTS officials were still operating, at least in part, under the authority of Abu al-Khayr al-Masri — that is, Zawahiri’s deputy. Al-Ghazi himself says that Abu al-Khayr had ruled on the distribution of weapons between HTS and the group that would become HAD. Before moving on, a note about Al-Ghazi is in order. For the past several months, FDD’s Long War Journal has been documenting his Telegram account. It is littered with references to al Qaeda figures, including a collection of Atiyah Abd-al-Rahman’s writings that al-Ghazi himself edited. Al-Ghazi has even promoted this collection of Rahman’s writings in recent weeks. This is a curious move for an HTS official who claims his group has disengaged from al Qaeda’s senior leadership, as Rahman was Osama bin Laden’s right hand man. Abu al-Khayr al-Masri was killed in a US drone strike in Feb. 2017. His death almost certainly caused further disruptions in al Qaeda’s chain-of-command and likely exacerbated tensions between HTS and its critics. After all, if Abu al-Khayr had lived, then the jihadists wouldn’t be arguing over what he did and didn’t rule between mid-2016 and early 2017 — he could answer those questions himself. It appears that Karim stepped up in Abu al-Khayr’s absence. Although HTS and HAD disagree on the circumstances surrounding Karim’s first attempt to broker a deal between the two in early 2018, Karim was still working to resolve their differences as of late 2018 and into the new year. The “Holding Fast Committee,” which took its name from a famous Quranic verse calling for Muslim unity, was comprised of a representative from each group, as well as an overall lead arbitrator. The jihadist serving as committee head was none other than Sheikh Abu ‘Abd al-Karim al-Masri (“Karim”). HAD’s representative was named as Abu Muhammad al-Sudani, while HTS’s committee member was Abu Malik al-Shami. Karim’s role as the committee head is significant. It means that for more than a year he was respected as an authority by both HTS’s and HAD’s leadership. Karim’s “Holding Fast Committee” was quickly called upon to adjudicate a dispute concerning a young girl named Yasmine. The little girl’s father had died while fighting alongside Firqatul Ghuraba (“Brigade of Strangers”), a group comprised of French-speaking jihadists that is openly loyal to al Qaeda. The girl’s Belgian mother, identified as Hajer, wanted her daughter returned and appealed to HTS for assistance. HTS then arrested the head of Firqatul Ghuraba, Omar Omsen, and other fighters, demanding that the girl be turned over to its custody so she could be reunited with her mother. Under Karim’s leadership, the “Holding Fast Committee” released statements concerning its handling of Yasmine’s case. Ultimately, HTS did return Yasmine to her mother, with the two meeting in Turkey. HTS publicized its role in securing the reunion, but so did Karim’s committee. The photo below was released by “The Holding Fast Committee,” after it decided in Hajer’s favor. The “Holding Fast Committee” mediated a dispute between HTS and HAD involving a young girl named Yasmine. However, as of early Jan. 2019, Omar Omsen was still in HTS’s custody. On Jan. 5, Firqatul Ghuraba released a two-page statement claiming that HTS continued to imprison Omsen (also known as Omar Diaby) despite the fact that he had been “cleared” of “all charges” related to the “kidnapping and ransom” demands in Yasmine’s case. Al-Zubayr al-Ghazi, the same HTS judge discussed above, had sentenced Omsen to four months in prison. Omsen served this period and yet he was still detained alongside two others from Firqatul Ghuraba in an HTS prison that handles “internal security affairs,” according to the group’s statement. Omsen’s comrades added that HTS’s prisons are known for torturing inmates. Firqatul Ghuraba noted that Omar Omsen (Diaby) had been designated as a terrorist by the US government, and is “a known figure” in France because he has openly espoused al Qaeda’s ideology. Indeed, Omsen produced a series of pro-al Qaeda videos under a brand name, 19HH, which is intended to laud the 9/11 hijackers. Firqatul Ghuraba added that there are great “pressures on Turkey” and the fighting factions in Syria to extradite Omsen. Omar Omsen (Diaby), as pictured in Firqatul Ghuraba’s appeal to the “Holding Fast Committee” in January. Firqatul Ghuraba then appealed directly to the “Holding Fast Committee,” arguing that the three-person council should have been able to handle the matter and ensure that Omsen and the two others were freed. But HTS’s courts insisted on owning the issue. “We appeal to the [Holding Fast] Committee to continue its efforts to implement God’s sharia from a neutral perspective, and we reiterate our complete submission to it — regardless of what happens,” Firqatul Ghuraba said in its statement. It is not clear what happened next. But this much is known: For some reason, Abu Hammam al-Shami and Sami al-Uraydi didn’t appeal to Karim or his committee when they attempted to subvert Julani’s authority in late January. Instead, the duo appealed to a broader circle of known pro-al Qaeda clerics and ideologues. Perhaps Karim’s rulings were seen as too friendly to HTS and the duo thought they would have more success by appealing to several known HTS critics. Only one of the clerics they appealed to (Sheikh Abu Qatada al-Filistini) is friendly to HTS, while some of the others are known HTS detractors. On Jan. 31, three HTS military officials – Abu Qatada al-Albani, Abu Ubaydah al-Shami and Abu Ubaydah al-Masri – responded to the Abu Hammam and al-Uraydi’s allegations. In a short statement posted online, the three HTS officials said they were “surprised” by the statement from Abu Hammam and al-Uraydi, as the two sides had a lengthy meeting just days earlier. Those talks focused on “reinforcing the frontline” positions and “organizing military” activities in the areas “liberated” from Assad. The HTS trio added that they “did not discuss” the commander who would lead the proposed “joint operations room,” nor did they address which faction would produce this chieftain, as that decision could only be reached through shura, or consultation. Abu Hammam and al-Uraydi had alleged that HTS was considering placing an Assad regime defector from a Turkish-backed rebel group in charge of a new military council that would oversee all operations in northern Syria. The HTS men said this was false, and they appealed to “brother Qassam and those who were with him” during the meeting to “give their testimony” on what happened. Although Abu Qatada al-Albani, Abu Ubaydah al-Shami and Abu Ubaydah al-Masri disputed Abu Hammam’s and al-Uraydi’s account of events, their rebuttal makes it clear that the two sides had been cooperating on the battlefield. Abu Qatada al-Albani’s presence at this meeting with HAD officials is likely significant. Although FDD’s Long War Journal cannot definitively confirm his identity, a jihadist with the same nom de guerre was named as the head of Al Nusrah Front’s military forces in the summer of 2014. Julani appointed Abu Qatada al-Albani to that position in a July 2014 address that was leaked online. The US Treasury Department designated Abu Qatada al-Albani — a native of Macedonia whose real name is Abdul Jashari — as a terrorist in Nov. 2016. Treasury said at the time that Abu Qatada had “helped to raise funds for the families of al-Nusrah Front fighters” and led Al Nusrah Front’s “military operations in northern Syria” during the summer of 2015. If it is one and the same person, and that appears likely, then Abu Qatada has maintained a significant military standing within the jihadists’ ranks for more than four and a half years. And he has been cooperating with HAD as well. The mention of “brother Qassam” also appears to be significant. As mentioned above, Qassam, or Abu al-Qassam, is one of the aliases used by Khalid al-Aruri, the brother-in-law of, and deputy to, Abu Musab al-Zarqawi. Aruri was reportedly released from Iran as part of a hostage exchange in 2015. Aruri (Qassam) fired back, saying this wasn’t true. Aruri revealed that Saif al-Adel and Abu Muhammad were not imprisoned, but instead “forbidden from traveling until Allah makes for them an exit.” The two members of al Qaeda’s senior management team “move around and live their natural lives except for being allowed to travel,” Aruri said. In other words, Aruri argued, Saif al-Adel’s and Abu Muhammad’s ruling against Al Nusrah’s public disengagement from al Qaeda was religiously legitimate. If “brother Qassam” is in fact Aruri, as suspected, then the HTS officials are still working with him as well. They appealed directly to him to set the record straight concerning what happened in the late January meeting between HTS and HAD. HTS and HAD have been colluding on the battlefield. Moreover, Abu ‘Abd al-Karim al-Masri has consistently been recognized as an authority by both sides. This is a curious fact for those who claim that HTS is completely out of the al Qaeda fold, as Karim is reportedly an al Qaeda shura council member. If HTS no longer adheres to al Qaeda’s authority at all, then why does it respect Karim’s? Regardless, it is also clear that the jihadists are divided on key issues, ranging from HTS’s al Qaeda fealty (or lack thereof) to HTS’s relations with Turkey. These divisions go well beyond Abu Hammam’s and al-Uraydi’s sniping at Julani and his HTS loyalists. Ayman al-Zawahiri has voiced his disagreements with various aspects of the jihadists’ strategy in Syria, including, most recently, their reliance on Turkey. Pro-al Qaeda clerics are also disagreeing amongst themselves. For instance, Tariq Abdul Haleem (an al Qaeda-linked religious figure living in Canada) was involved in an intense disagreement with Abu Qatada al-Filistini (who lives in Jordan) over the direction of the jihad in Syria. Both men, mind you, are considered religious authorities by al Qaeda. And both men openly respect Zawahiri. Yet, they do not see eye-to-eye when comes to HTS. Other ideologues had to broker an online truce between the two geriatric jihadists in recent days. Though HTS apparently maintains the lion’s share of support, fighting factions inside Syria also disagree over the course being pursued. Abu Hammam and al-Uraydi asked any groups that disagreed with HTS’s supposed military council to stand up and be counted. Several factions did just that. However, HTS countered with a statement of support from high-profile foreign fighter groups. The first signatory on the pro-HTS statement is the emir of the Turkistan Islamic Party (TIP) in Syria. The TIP still advertises its allegiance to the al Qaeda network. 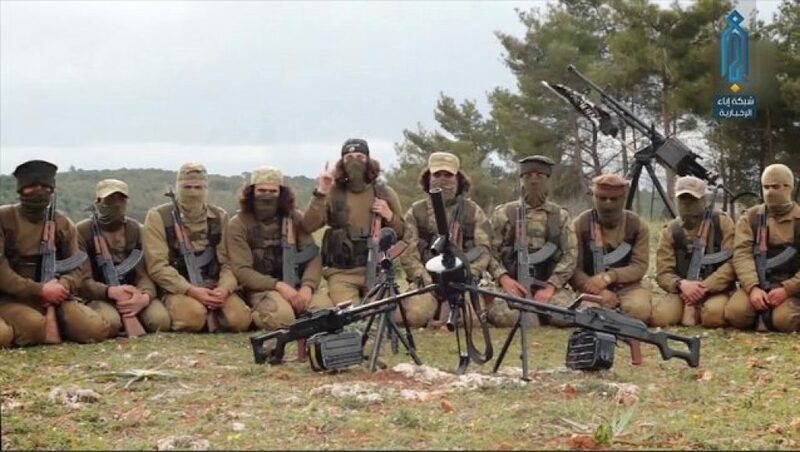 As FDD’s Long War Journal has assessed in the past, the TIP’s continued relationship with HTS undoubtedly strengthens Julani’s hand, as the TIP is one of the strongest foreign fighter groups in northwestern Syria. Julani’s critics have alleged that HTS is preparing to sell out the muhajireen, but the continued support of the TIP and other foreign fighter groups inoculates him against that charge. No one can predict what the future holds, but if the past is any indication, then we shouldn’t be surprised if even more divisions within the jihadists’ ranks emerge going forward. In the meantime, Abu ‘Abd al-Karim al-Masri is undoubtedly still trying to stop that from happening.